Work plays an important role in every human being’s life. Employees work life helps in shaping their personality, determining performance and so that is why Quality of Working Life is essential in every organization. Employees welfare include monitoring of work environment from time to time, maintaining industrial harmony and peace through infrastructure of health, industrial relations, insurance against disease, accident and employment for employees and their families. Quality of Working ng Life of employees in organization is a way of thinking about people, work and organization which creates a sense of accomplishment and achievement in mind of employees that contributes to greater job satisfaction, improved productivity, efficiency, perf performance, skills, adaptability and overall effectiveness in an organization. The term ‘Quality of Working Life’ of employees in organization gained importance in late 1960s as a strategy of concern about effects of job or work life on health and general well-being being of individual’s and various ways to positively upgrade quality of an individual’s work and life experiences. Up until the mid 1970s, employer’s concern regarding ‘Quality of Working Life’ of employees was only on work culture and how to enhance working orking conditions in an organization. But in 1980s, the concept of ‘Quality of Working Life’ of employees in organization included other aspects that affect Employees Job Satisfaction & Productivity. These aspects are Pay Scale, Monetary & Non-Monetary Benefits, efits, Physical Work Environment & Work Culture, Employee Involvement in Management Decision Making, Rights & Esteem Needs of Employees in an organization. Thus, Quality of Working Life of employees in organization is the sum total of physical (working conditions), nditions), psychological, social and economic factors that affect job and employees productivity. Indicators of Quality of Working Life of employees in organization are Job Satisfaction, Job Involvement, Work Role Ambiguity, Work Role Conflict, Work Role Overload, verload, Job Stress, Organizational Commitment & Turn Over Intentions. According to Amuno - “Quality of Working Life includes Increased Productivity, Improved Quality of Work Life, Polished Skills, Knowledge, Understanding & Attitude, Enhanced Use of Tools & Machines, Reduced Wastes, Accidents, Turnover, Lateness, Absenteeism & Other Overhead Costs, Elimination of Obsolesce in Skills, Technologies, Methods, Products, and Capital Management etc”. International Journal of Trend in Scientific Research and Development (IJTSRD) ISSN: 2456-6470 2456 ORGANIZATION PROFILE - INSULATORS & ELECTRICALS COMPANY (I.E.C) Insulators & Electricals Company is country’s one of the leading insulator manufacturing plant of Hindustan Vidyut Products Limited a R. P. MODY group was established at Mandideep Industrial Area near by Bhopal state capital of Madhya Pradesh in 1986 with ith 6000 M.T. per annum installed capacity and by adding 4 more shuttle kiln & have turnover of around USD 100 Millions (Rs. 500 Crores). This plant was set up in technical collaboration with M/s. Rheinisch Westfalishe Isolatoran – Werke GmbH (RWI), Germany. y. The detail engineering of this plant was done by Tata Consulting Engineers. The plant has been in operation for more than 30 Years and has today become a major source of Overhead Conductors, XLPE Cables & Porcelain Insulators to worldwide companies. The present plant capacity has reached up to 14400 M.T. per month. LITERATURE REVIEW Chelte (1983) “Quality of Working Life of employees in organization is the quality of relationship among employees and total working environment, with human dimensions, technical and economic considerations”. Graver Robert F (1983) “Quality of Working Life is more than fad, more than any attempt to pacify growing demands of impatient employees and for the manager, Quality of Working Life can offer new challenges, opportunities nities for growth and satisfaction to employees in organization”. Warr, P, Cook, J & Wall (1979), Danna, K., & Griffin, R. W. (1999). Sirgy, Efraty, Siegel et al. (2001) “Quality of Working Life of Employees in Organization is considered as a range of apparently relevant Factors including Work Environment, Employees Involvement, Intrinsic Employees Motivation, Job Security, Higher Order Need Strength, Perceived Intrinsic Job Characteristics, Job Satisfaction, Life Satisfaction, Happiness & Self Rated Anxiety”. Daya Narayan (1997) “In organizational design and development, Quality of Working Life of employees in organization is considered as an approach seeking to improve work environment and employee employer relationship”. International Journal of Trend in Scientific Research and Development (IJTSRD) ISSN: 2456-6470 2456 Monographs, Unpublished Reports & through Internet. Thus, researcher has used correlation technique to determine impact of Quality of Working Life of Employees on their Productivity of Insulators & Electricals Company, Mandideep. 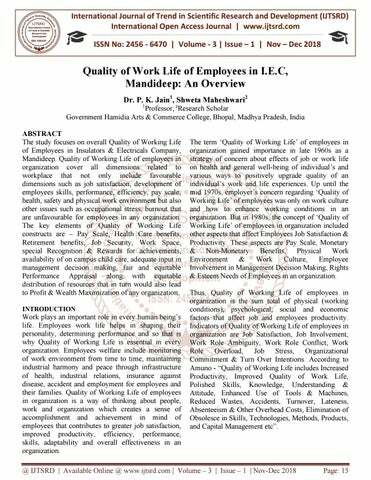 The researcher has found positive correlation of each Quality of o Working Life Variables regarding Employees Productivity that itself represents that Quality of Working Life of Employees in I.E.C has deep impact on their Productivity. CONCLUSION Work is the most essential part of every individual’s life as it is livelihood ihood and career of a human being. Organizations are made up of individuals and can only function with the help of individuals. Without individuals any organization cannot exist or run smoothly. The various sources of production such as Men, Money, Materials ls & Machinery are collected together, coordinated and utilized through human beings in an organization. Other factors of production cannot work without involvement of human resource in any organization. Human capital is real asset for any organization and can become secret for organizational success and all other sources of production can only be utilized and managed through human resources only. So, it is extremely essential to gain involvement of these human assets in every work area in order to ensure efficiency, fficiency, performance and productivity. Thus, Insulators & Electricals Company is pioneer in maintaining Quality of Working Life of Employees within organization that is proving to be a milestone in industrial sector which not only enhances their employee’s ’s productivity and skills but also leads to profit and wealth maximization of I.E.C. 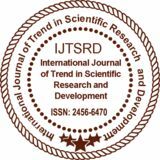 International Journal of Trend in Scientific Research and Development (IJTSRD) ISSN: 2456-6470 2456 REFERENCES 1. Arthur, M.B., Hall, D.T., & Lawrence, B.S. (Eds.) (1989) - Handbook of Career Theory, Cambridge: Cambridge University Press. 2. Baba, VV & Jamal, M (1991) - Routinisation of Job Context & Job Content as related to Employees Quality of Working Life: a study of psychiatric nurses. Journal of Oganizational Behaviour, volume 12, page 379 - 386. 3. Bear field, S (2003) - Quality of Working Life. Aciirt Working paper 86, 6, University of Sydney www.acirrt.com. 4. Berry, L. M. (1998) - Psychology at Work: An introduction to Industrial & Organizational Psychology, San Francisco: McGraw - Hill. 5. Cannings, K. & Montmarquette, C (1991) Managerial Momentum: a Simultaneous Model of the Career Progress of Male & Female Managers, Industrial & Labour Relations, Review volume 44, page 212 – 228. 6. Cascio, W.F. (2003) - Managing Human Resources: Productivity, Quality of Work Life, Profits. (6th edition), New York: McGraw - Hill. 7. Cox, C.J. & Cooper, C.L. (1989) - The making of the British Chief Executive Officer: Childhood, Work Experience, Personality & Management Style. Academy of Management Executive, volume 3, page 241 – 245. 8. Cunningham, J.B. & T. Eberle (1990) - A guide to Job Enrichmentt & Redesign. Personnel, volume 67, page 56 – 61. 9. Danna, K. & Griffin, R. W. (1999) – Health & Well - Being in the Workplace: A review & synthesis of the literature, Journal of Management, volume 25, page 357 – 384. 10. Edwards, J., Van Laar, D.L. & Easton, S. (2009) The Work - Related Quality of Life scale for Higher Education Employees, Quality in Higher Education, Volume 15: 3, page 207 – 219. 11. Ellis N & Pompli A (2002) - Quality of Working Life for nurses. Common Wealth Department of Health & Ageing, Canberra. 12. Feuer, D. (1989) - Quality of Work Life: a cure for all ills? Training: The magazine of Human Resources Development, volume 26, page 65 – 66. 13. Greenhaus, J.H., Parasuraman, S & Wormley, W.M. (1990) - Effects of Race on Organizational Experience, Job Performance erformance Evaluations & Career Outcomes. Academy of Management Journal, volume 16, page 129 – 137. 14. Hackman J & Oldham G (1974) - The Job Diagnostic Survey, New Haven: Yale University. 15. Lawler, E. E. (1982) - Strategies for improving the Quality of Work Life, e, American Psychologist volume 37, year 2005, page 486 – 493. 16. Lewis, S. & C.L. Cooper (1999) - The Work Family research agenda in changing contexts, Journal of Occupational Health Psychology, volume 4, page 382 – 393. 17. Loscocco, K. A. & Roschelle, A. Influences on the Quality of Work Life: Two Decades in Review, Vocational Behaviour, volume 39, 225.